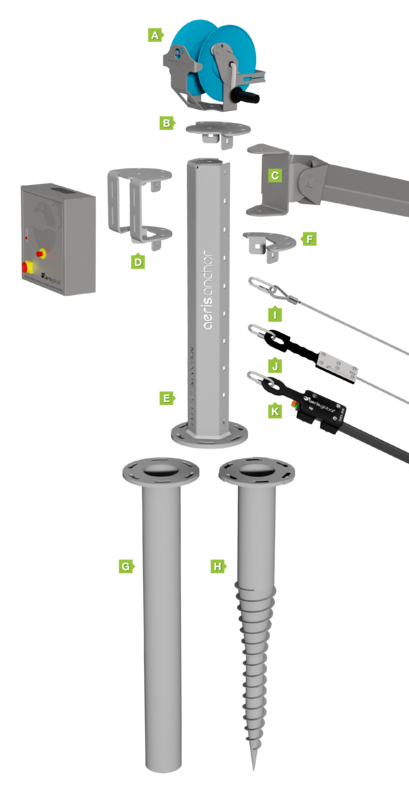 Purpose-designed, relocatable post and pile system provides universal attachment for all Aercable accessories. Three versions to suit a wide range of mooring forces; laser-cut, hot-dip galvanised mild steel construction. Slotted flange connection allows radial adjustment for perfect alignment. Non-standard designs and stainless-steel versions upon request. Optional excavation-free Ground Screw allows same-day utilisation. Designed to safely store, dispense and retrieve surplus cable required for aerator repositioning. Multiple mooring cable connection points. Incorporates swivel mounting for single and double-spools. Directional aerators and mixers are typically swing-arm mounted. The Yoke Attachment Bracket is designed to allow connection of the fully-articulated swing-arm yoke as well as providing multiple mooring cable connection points. Mounting bracket allows attachment of virtually any electrical enclosure as well as providing multiple mooring cable connection points. Anchor Post is the core component of the system. It provides attachment of all bracket options. The Adjustable Bracket can be attached at 100mm increments. Standard Bracket, Yoke Attachment and Junction Box Brackets connect only to the top of the post. Allows attachment of Mooring Cable, Strain Relief and Quick-release Connectors at 100mm increments. Set-In-Place, hot-dip galvanised mild steel pile. Self-drilling, hot-dip galvanised mild steel pile. Allows partial release of mooring cables to reposition aerator for access. Upon reconnection aerator is automatically returned to its pre-set, normal operating position.